Justin Thomas was the star performer but the little-known left-hander leads at Erin Hills. BRIAN HARMAN WILL head into the final round of the U.S. Open with a one-stroke lead, after overhauling record-breaker Justin Thomas on an enthralling, low-scoring Saturday at Erin Hills. Thomas broke new ground with a sensational performance in round three – his nine-under 63 representing the lowest score to par in U.S. Open history. When he reached the clubhouse, having surpassed Johnny Miller’s eight-under round at Oakmont that secured victory in the 1973 edition of this event, Thomas led by two shots. However, Harman and Tommy Fleetwood – who had shared first place with Brooks Koepka and Paul Casey at the start of the day - came on strong over the inward nine to reclaim pole position. Englishman Fleetwood gave up his share of first place with a sloppy bogey at the 18th, leaving Harman (67) on his own at 12 under. Thomas, Fleetwood and Koepka ended the day a solitary shot off the pace, while Rickie Fowler and Kim Si-woo were firmly in contention at 10 and nine under respectively. The latter quartet all shot 68 in round three. The USGA is renowned for setting a fiendish test in its national Open, but a lack of wind and greens softened by overnight rain ensured birdies flowed at Erin Hills throughout ‘moving day’. Only Rory McIlroy, on his way to victory at Congressional in 2011, has managed a lower score to par through 54 holes than Harman’s current number. Gusts are forecast to pick up on Sunday, when a new major winner appears all but certain to be crowned with none of the top 16 on the leaderboard having previously taken out one of golf’s premier strokeplay events. World number 50 Harman, who pipped Dustin Johnson to the Wells Fargo Championship title last month, would represent a particularly surprising champion given his relatively low profile. Yet he excelled in the penultimate round, maintaining the accuracy off the tee that has served him so well all week and making putts at key moments. Thomas’ unprecedented round was all the more remarkable for the fact it featured two bogeys, at the fourth and 10th. They were comfortably outweighed by nine birdies, the most spectacular coming at the fifth, where Thomas held a putt that broke at a 90 degree angle, and 12th, the scene of an unlikely recovery from the fescue rough. If Thomas had already caught the eye – both with his impressive play and bright pink trousers - by the time he reached the 18th, the best was certainly still to come. An accurate three-wood off the 18th tee was followed by a dazzling approach from 299 yards with the same club, before the world number 13 rolled in an eight-foot eagle putt to make history. Prior to Thomas’ fireworks, Patrick Reed had produced the round of the day – a 65 lifting the ever-confident American into a share of seventh at eight under. Yet as so many of his rivals found birdies easy to come by, Casey dropped out of contention with a 75 that featured a triple-bogey seven at the third. Email “Ahead of the final round, it's Brian Harman who's the man to catch at the US Open”. 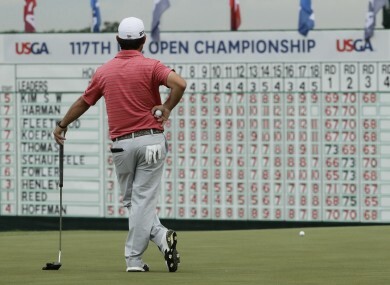 Feedback on “Ahead of the final round, it's Brian Harman who's the man to catch at the US Open”.